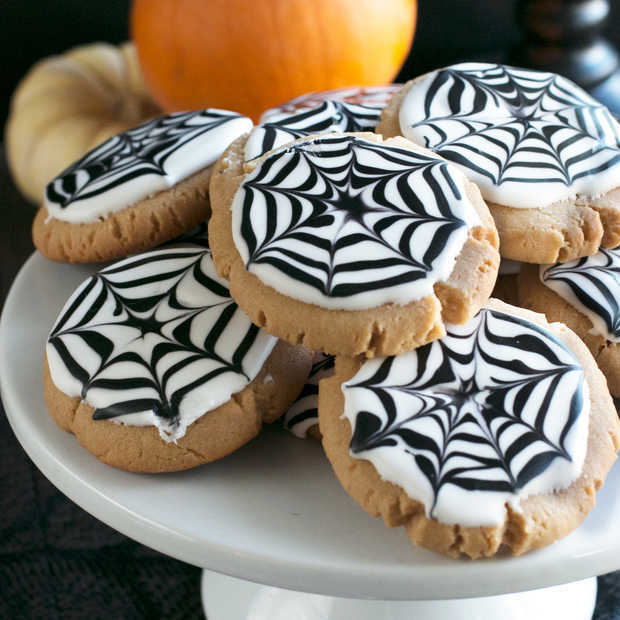 Bring out the spooky with Peanut Butter Spiderweb Cookies this Halloween! 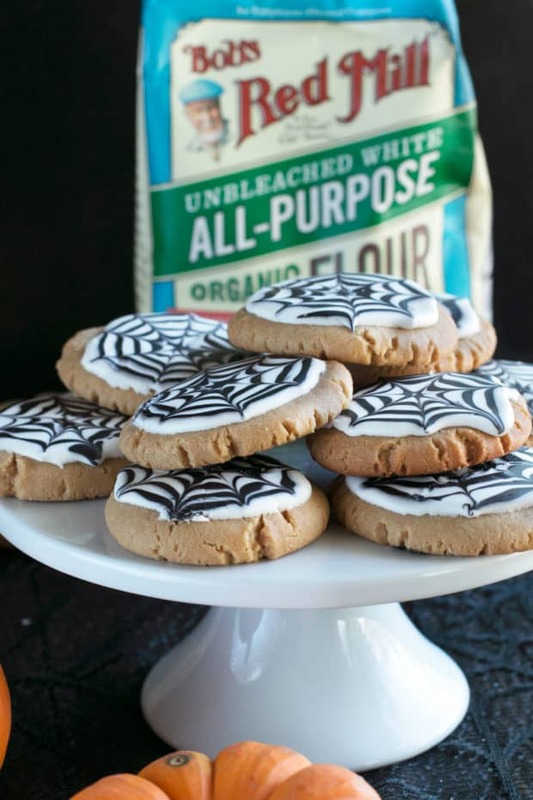 Chewy, flavorful peanut butter cookies are topped with easy-to-make royal icing spiderwebs for a sweet treat everyone will love. 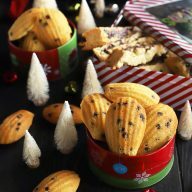 You’ll never believe how simple these festive cookies are to make AND decorate! YOU GUYS! I made something sweet, delicious AND adorable for Halloween this year! You don’t even know what a huge step this is for me. Normally my Halloween celebrations are limited to festive cocktails (like this Absolut Elyx Black Magic Martini and this Butterbeer Cocktail) and a big vat of spicy chili while I cuddle up waiting for trick-or-treaters with Hocus Pocus. This year I thought I’d broaden my horizons and experiment with a festive dessert this Halloween. I don’t know why, but when fall rolls around, peanut butter starts making a more regular appearance in my diet. I think it’s because it’s so rich and creamy, and it pairs so well with those freshly harvested apples. Is there anything better than a freshly baked, chewy peanut butter cookie with a giant glass of milk? The chewy cookie, the deep peanut butter taste… It’s one dreamy bite after another. I mean, why not kick off the holiday baking season early, am I right? The funny thing about baking is, you never really know how much using a high-quality flour matters until you start using one. That’s where my favorite Bob’s Red Mill Organic All Purpose Unbleached White Flour comes in! Whether you are a novice or an advanced baker, you should be using this flour. It’s everything you need for anything that you bake from these cookies to bread, pizza crusts to cakes. It’s honestly the only flour brand I trust, because time and time again it makes all of my baked goods come out just right. Take these cookies for example. Using the right flour REALLY matters to make sure you get just the right chewy texture. Plus Bob’s Red Mill Organic All Purpose Unbleached White Flour is kosher, vegan, AND USDA certified organic! 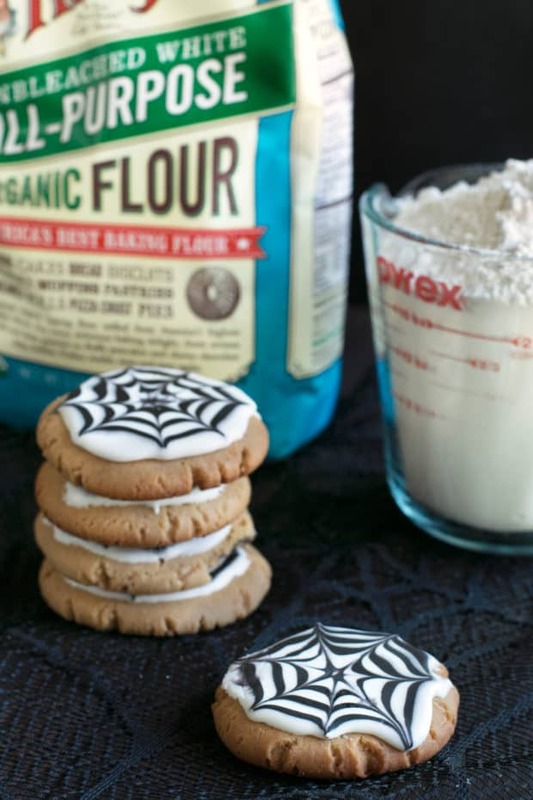 I know some of you might be wondering if you can pull off the spiderweb icing on top and let me assure you right here and now, you CAN. 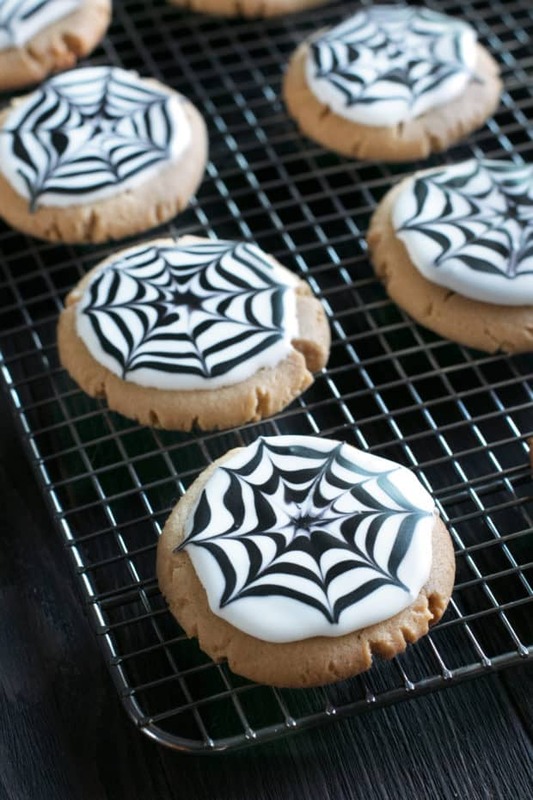 First, this royal icing is ridiculously simple to make. Second, the decoration is deceivingly simple. You simply put a layer of white icing down first. Then you put a black dot in the center and make a black spiral working out from the center to the edge. The magic happens when you drag a toothpick from the center dot to the outer edge! You do that all around the cookie and VOILA. 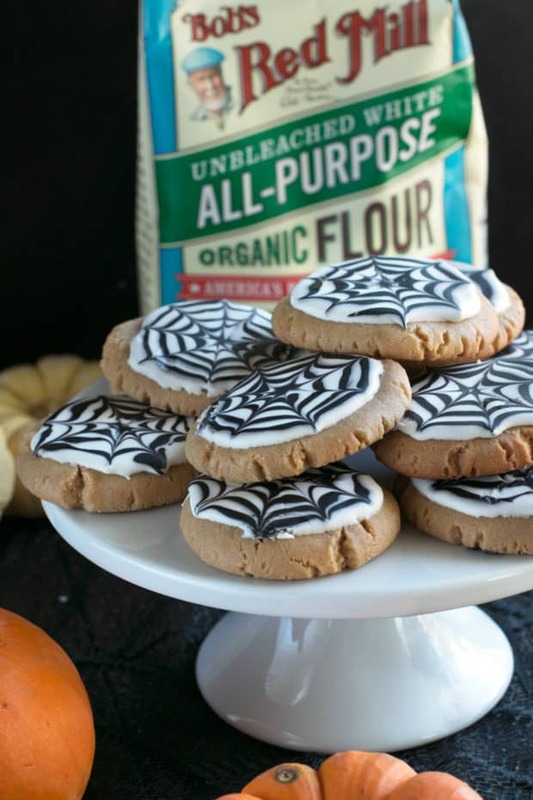 Perfect spiderwebs for whatever spooky celebration you have coming up this weekend! 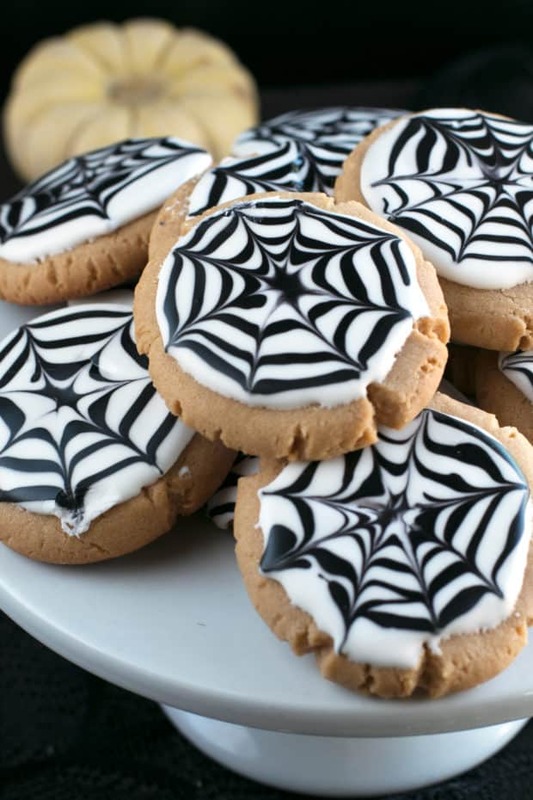 Pin this Peanut Butter Spiderweb Cookies recipe for later! 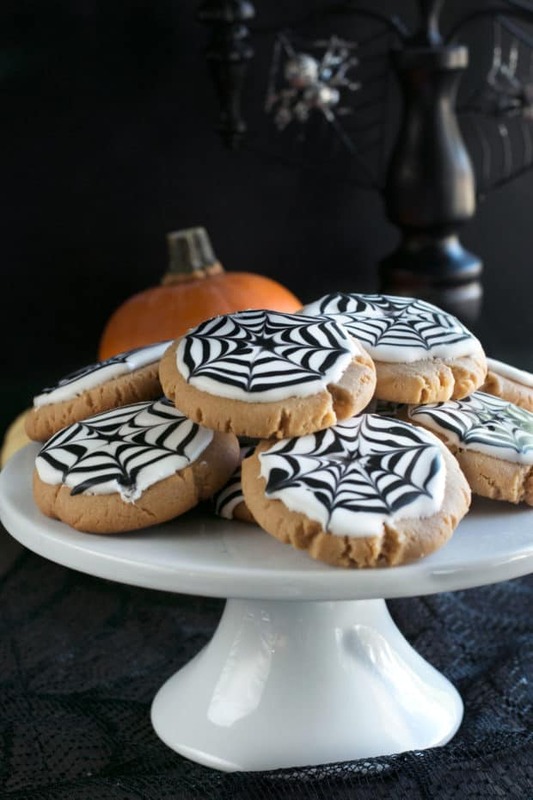 Soft and chewy peanut butter cookies are the perfect treat for anyone's treat bag this Halloween! 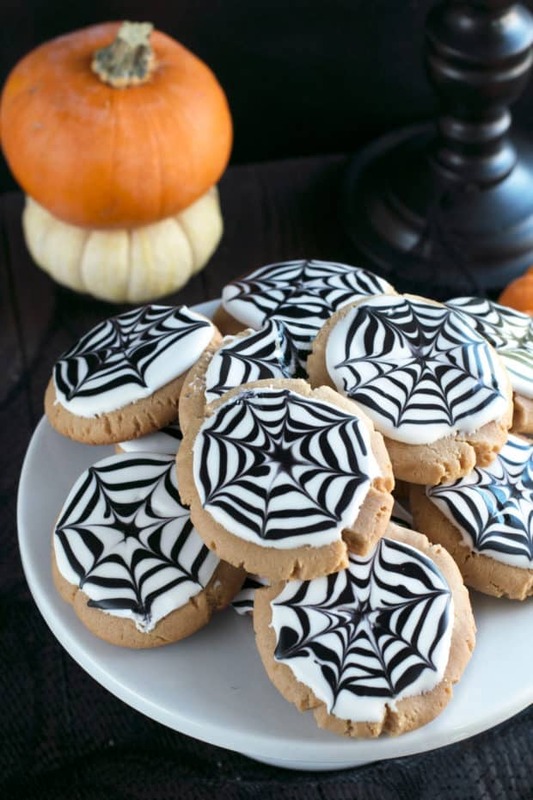 Topped with a festive, easy-to-make spiderweb frosting, you'll be saying BOO in no time. In the bowl of a stand mixer, cream together butter and sugars. Add eggs and beat until combined. Scrape down the sides of the bowl and add vanilla and peanut butter, beating again until combined. Add flour, baking soda, baking powder and salt to the mixture. Mix on low until combined. Cover the bowl with plastic wrap and refrigerate for at least 2 hours. When ready to bake, preheat oven to 350 degrees. 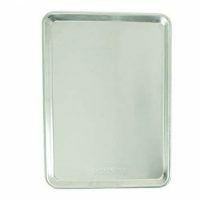 Line 2 baking sheets with silicone mats or parchment paper. Roll approximately 1 1/2 to 2 Tbsp of dough into a ball. 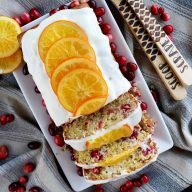 Place on rimmed baking sheets. Bakes 12 to 15 minutes. Cool for 10 minutes on the baking sheets, before removing to cooling racks to finish cooling. 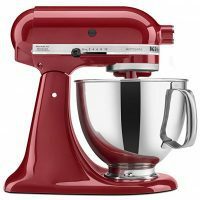 To make the icing, add egg whites and vanilla to a large bowl of a stand mixer. Beat until frothy. Slowly add confectioner's sugar and mix on low until the sugar is completely incorporated. Turn speed up to high and beat until the mixture forms stiff, glossy peaks, mixing for approximately 5 to 7 minutes. Add black In large bowl of stand mixer combine the egg whites and vanilla and beat until frothy. Add confectioners' sugar gradually and mix on low speed until sugar is incorporated and mixture is shiny. Turn speed up to high and beat until mixture forms stiff, glossy peaks. This should take approximately 5 to 7 minutes. Remove 1/3 of the icing in the bowl to a smaller bowl. To the smaller bowl, add black food coloring 1/2 tsp at a time until the mixture is desired shade of black. Transfer to a small piping bag and set aside for the moment. 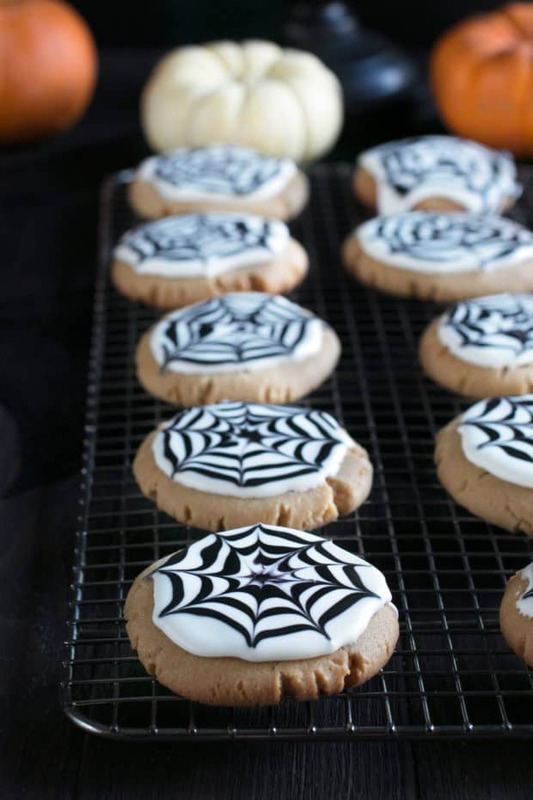 Gently spoon the white royal icing onto the center of a completely cooled cookie. Slowly smooth the icing with the back of a spoon into a circle on top of the cookie. 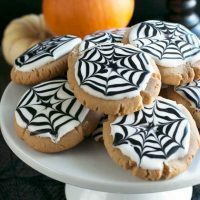 Place a small dot of black icing in the center of each cookie. Working from just to the left of that dot start counterclockwise, make a spiral working out to the edge of the cookie. 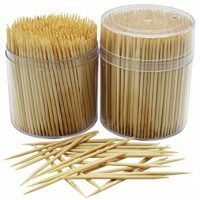 Using a toothpick, starting with the dot in the center, run a line from the center to the edge of the cookie. 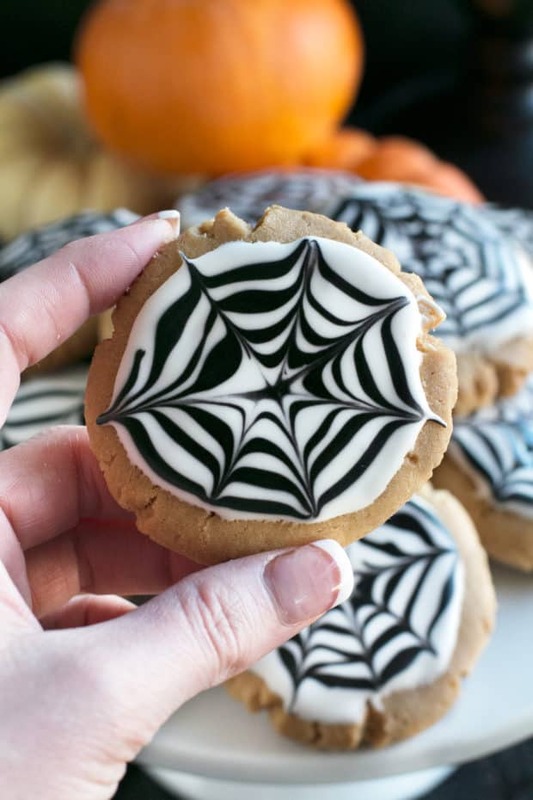 Repeat all around the cookie to form a spiderweb, approximately 5-6 lines. 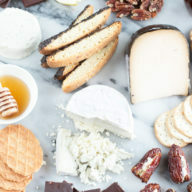 Repeat this with the remaining cookies. Let set until the icing is set, approximately 1 hour. Okay, these are SO stinkin’ cute. And talk about delicious- does it really get any better than an iced peanut butter cookie? For frosting you list lemon juice but I’m the body you say vanilla, which is it? These peanut butter cookies sound delicious! I want to make it at home. Is there any alternative to confectioners’ sugar? 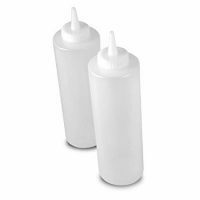 I haven’t used a substitute for confectioners’ sugar for royal icing before, but I have heard of people grinding artificial sweetener and cornstarch in a blender together to make a substitute. I personally haven’t used that though, so I am not sure what that would do to the consistency of the icing. Sorry I can’t be more helpful with that!